Q. How do I create/copy a large number of bookmarks at once? 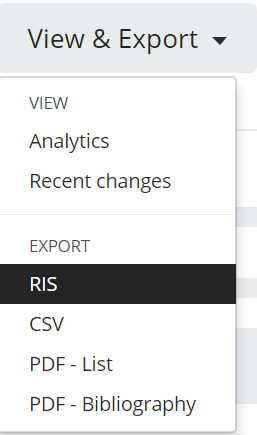 In addition to Bookmarking Readings one at a time you can also import longer lists as RIS files. Below are the instruction for exporting multiple items from One Search, or an existing reading list, and adding them to your personal Bookmarks in Readings. Note that the procedure for collecting multiple bookmarks in One Search will be similar across any database that allows you to export RIS (or Endnote) files. 3. Save each item you require by clicking on the File symbol (shown here in red) next to the title. Do this for each item. 4. Go to Saved items by clicking on top right File symbol (The folder will display the number of items you have saved). Selecting this button will open a new page, your saved items will be list. 6. Save file with a memorable name (how this option appears will depend on the browser you are using), in a place you can easily find (e.g. the subject code). Note the file may try and open in Endnote if you have it on your computer to avoid this open from your downloads folder. Once this file is saved go to the Import to Readings instructions below. 4. Save file with a memorable name (how this option appears will depend on the browser you are using), in a place you can easily find (e.g. the subject code). Note the file may try and open in Endnote if you have it on your computer to avoid this open from your downloads folder. Once this file is saved go to he Import to Readings instructions below. Note: If you have not already created your list you can choose to 'Add imported resources to new list' this will prompt you to create a list. 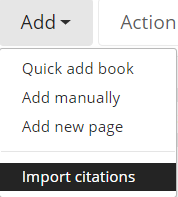 Otherwise you will need to drag the bookmarks into a new list in the Edit view.